Hong Kong Markets are colorful and lively, a photographer's paradise and a great place to people watch, sample some local foods, catch a few bargains, or simply soak some of the local flavour as this is still pretty much a part of every day life in Hong Kong. 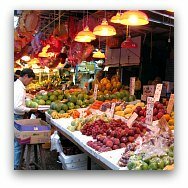 Visiting a market won't be difficult and certainly something we would recommend doing during your stay, there will always be options nearby and chances are you will run into one during your visit. 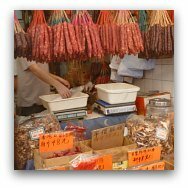 Here we list some of our favourite Hong Kong Markets and a sample walking tour to cover an attractive area with some of the most well-known markets and shopping streets which we have enjoyed on our visits. 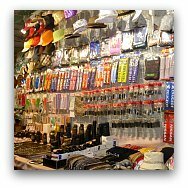 These are the most popular and lively markets to go shopping for clothing, souvenirs, knick knacks, hand bags, small electronics and gadgets, etc. 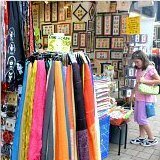 anything you can think of with the "made in China" label would probably end up at one of these markets so if you want to get some great bargains, are in the mood for some serious haggling and don't mind the crowds, you will definitely enjoy these. 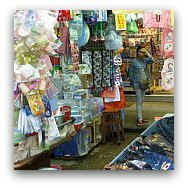 This is one of the top Hong Kong Markets for bargain-priced clothes and accessories, and despite its name, it is not only for ladies, you find just about everything here, including small household items and toys. Our favourite night market, very lively and full of bargains. 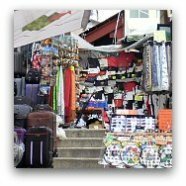 Here you find clothes, souvenirs, small electronics, and many food stalls and open-air restaurants. A bit further away from the city in the southern part of Hong Kong Island, Stanley has been popular with tourists for years, and remains one of the favourites for souvenirs and knick knacks. 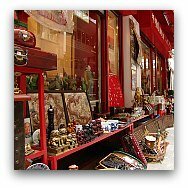 Full of antique and curio shops and stands, anything from little buddha images to silk carpets, ming vases, ceramics, etc. not all real "antiques", great fun to browse and pick up a few trinkets here and there. 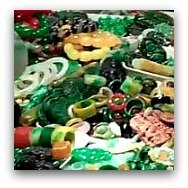 Dozens of stalls selling jewelry, pearls, stones, and as you might have guessed jade pieces, beads, pendants, carvings... I would stay away from any expensive stuff unless you really know your jade. Very popular with the locals, over a hundred stalls selling a great variety of cheap clothing and accessories, toys and small electronics. This street runs parallel to the Ladies Market, so very convenient. 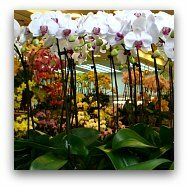 A little oasis brimming with fragrant blooms, bonsai trees, fresh cut flowers, exotic plants, and an abundance of foliage and color that is truly a treat to the senses. 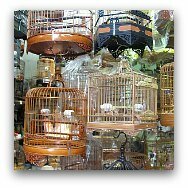 The Chinese had traditionally liked to keep birds as pets. Here you see the old men with their cages taking their birds for "walks", beautiful handcrafted bamboo cages, and all sorts of peculiar "bird food"
A fascinating street crowded with little shops with an incredible amount and variety of all kinds of sea life, lots of color in the tanks and the little fish bags set up in front of the stores. 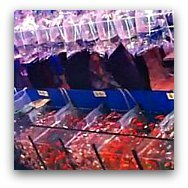 Fish, crabs, lobsters, shell fish, sea cucumbers, eels... all displayed live and swimming... 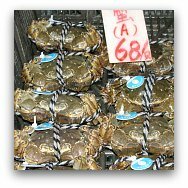 The seafood markets and restaurants in Lamma Island are quite popular and worth an excursion. All kinds of dried seafood, ginseng, snakes, herbs, etc. normally in the older and more traditional areas of town, we quite enjoyed the area in the Western district, which we combined with a Ding Ding Tram ride. 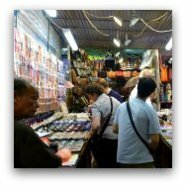 Check out the best of Kowloon Markets with a small group, maximum of 12, together you will explore Hong Kong's market scene, test your bargaining skills, try the savory treats from one of the many open-air food stands. The tour starts at 2:00 p.m. as you meet your guide at the Prince Edward MTR Station. 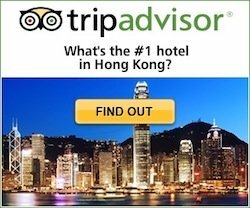 It lasts approximately 3 1/2 hours and it will bring you to the Flower Market, Bird Garden, Goldfish Market, Ladies Market, Shanghai Street (Wedding Street), Jade Market and ending by the Temple Street Night Market. 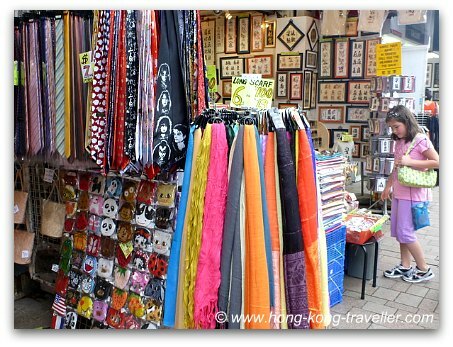 ›› More Hong Kong Shopping Tours here.